I've been prompted to start my Christmas Card making a little earlier than usual this year by the lovely Fiona at Joy of Sets. She's challenged us to pop a card into the Christmas Card album from now until the festive season on a regular basis. I've decided to go for one a week, but don't hold me to that. I've also opened up a Christmas Card and a Christmas Project play list on my You Tube channel so that I can start to populate those too to hopefully inspire and evoke a whole new generation of paper crafters to take up the Tombow and let the creativity flow. 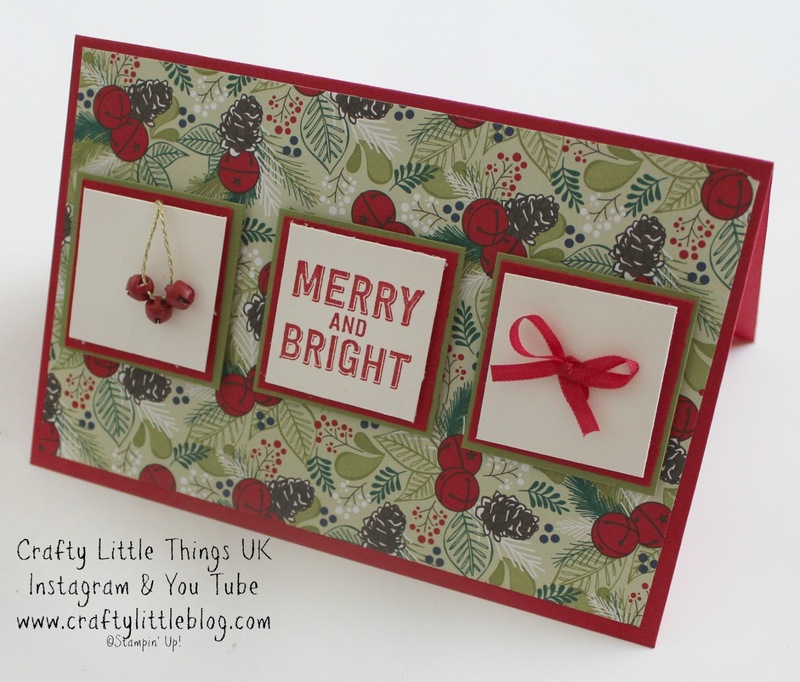 I'm not usually that well organised and so I jumped at this chance to get organised and so here is my first Christmas Card of 2018 there is a tutorial on my channel for this too. I decided to go oh so traditional with this one using the fabulously traditional dsp stack from the current Stampin' Up! annual catalogue and sticking with festive red as my card base. I followed through with the jingle berries on the DSP and added some retired tiny jingle bells threaded on also retired gold thread. If you don't have any of these you can pick them up on resale or use other brands. A gold crochet yarn would work well and the Works usually have some fab jingle bells in their festive range. I opted for an inchie style for my landscape card, using old olive which is in the dsp design and also real red and then the top layer of Very Vanilla is either adorned with the jingle bells, or stamped using real red ink and a stamp from the retired Watts of Occasions stamp set and for the final inchie I popped on a red ribbon bow using current 3mm ribbon. I used dimensionals for the very vanilla layer and for the whole inchie to attach to the card base but I just glued the old olive and real red layers together so that it wasn't too protruding. I love it and hope you do too. I'm looking forward to next week already and I will be using retired stock and non SU stock too so there should be something for everyone.